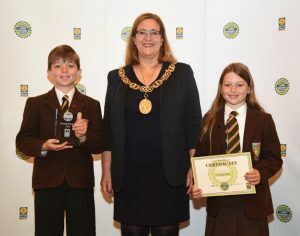 Cara Gray and Magnus Hunter represented Jordanhill School at the City Chambers on Tuesday 28th August to receive a Road Safety Award. Little did they know that Jordanhill was one of three schools from 30 present to receive the Lord Provost Award. Congratulations to all of the pupils and staff whose work last session led to this award. Our Primary pupils will be following up on this shortly by asking all parents to sign a pledge to drive safely. The trophy is now in the display cabinet.